Black Paint - High quality acrylic paints - Easy to use and mix. Thin paint and clean brushes w..
Scarlet Paint - High quality acrylic paints - Easy to use and mix. Thin paint and clean brushes.. Bright Red Paint - High quality acrylic paints - Easy to use and mix. Thin paint and clean brus.. Deep Red Paint - High quality acrylic paints - Easy to use and mix. Thin paint and clean brushe.. Plum Red Paint - High quality acrylic paints - Easy to use and mix. Thin paint and clean brushe..
Burgundy Paint - High quality acrylic paints - Easy to use and mix. 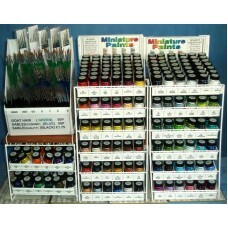 Thin paint and clean brushe..
White Paint - High quality acrylic paints and inks - Easy to use and mix. Thin paint and clean ..
Citrus Orange Paint - High quality acrylic paints - Easy to use and mix. Thin paint and clean b..
Orange Paint - High quality acrylic paints - Easy to use and mix. Thin paint and clean brushes .. Pink Paint - High quality acrylic paints - Easy to use and mix. Thin paint and clean brushes wi..
Magenta Paint - High quality acrylic paints - Easy to use and mix. Thin paint and clean brushes wi..
Coral Paint - High quality acrylic paints - Easy to use and mix. Thin paint and clean brushes w..
Apricot Paint - High quality acrylic paints - Easy to use and mix. Thin paint and clean brushes.. Cream Paint - High quality acrylic paints - Easy to use and mix. Thin paint and clean brushes w..
Mid-Grey Paint - High quality acrylic paints - Easy to use and mix. Thin paint and clean brushe..